Dining at Walt Disney World Resort in Florida can range from a quick-service burger to a gourmet steak. 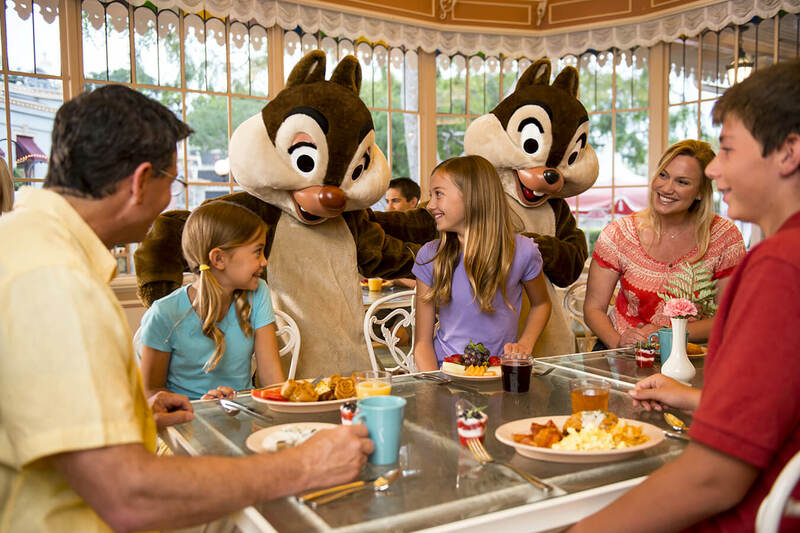 But one of the experiences it’s most famous for is the Character Dining! 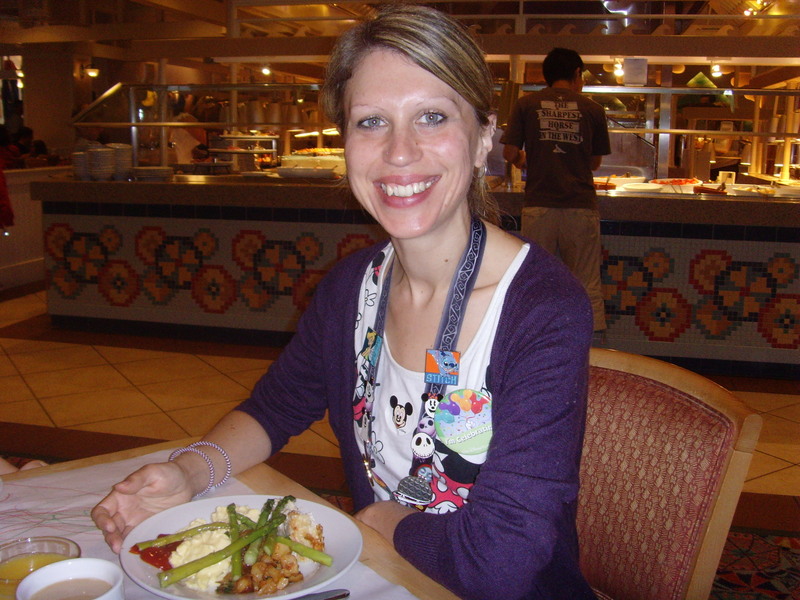 So what is Disney Character Dining? 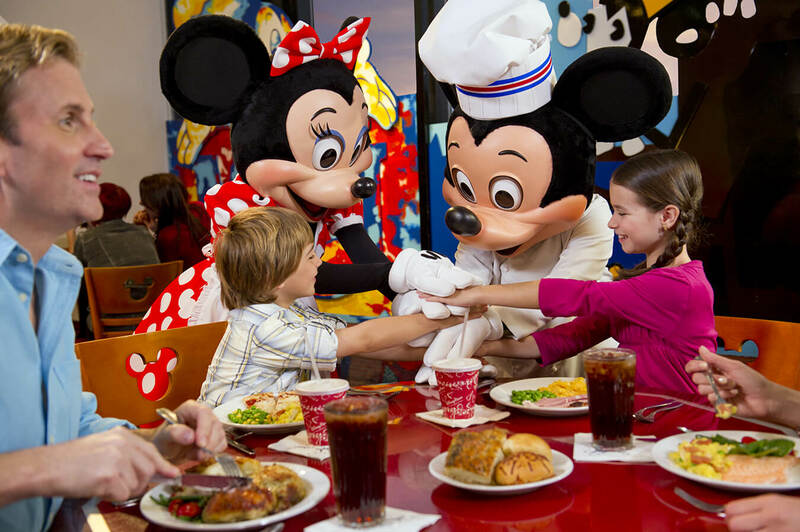 Basically, you can book meals at some theme park and Disney Resort Hotel restaurants where the Disney Characters come to you! This is a great way to get some one-on-one time with the Characters without the queues and crowds you’d get in the parks, and they’re especially fun for children to get photos and autographs. 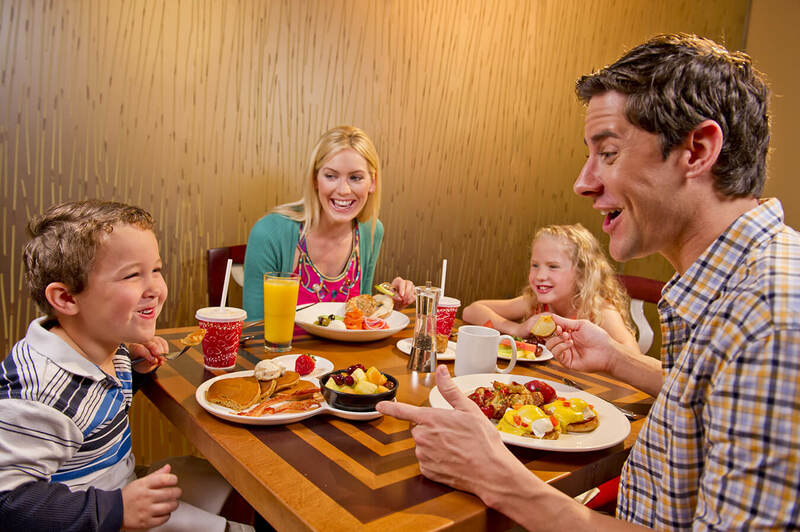 This Disney Character Breakfast includes cereals, baked goods and lots of cooked choices including the infamous Mickey waffles. Brunch includes specialities like Chili-Cornbread Casserole, Baked Salmon and of course the Mickey waffles! Insider Tip: Keep a look-out for the napkin-swirling dancing! Characters include: Lots of Disney Princesses! 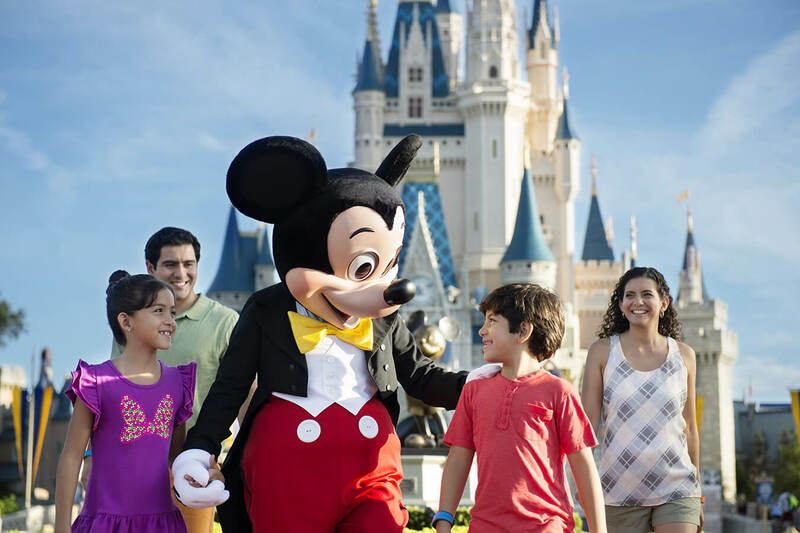 Imagine eating a meal at Cinderella Castle in Magic Kingdom Park, with a whole array of princesses coming to visit you. Every little prince and princess’s dream come true!! This is a pre-plated meal with some delicious choices including a traditional breakfast, beef tenderloin salad and pan-seared all-natural chicken. There are a small selection of desserts too. Insider Tip: This experience is extremely popular, and I’d advise making your Advanced Dining Reservation as early as you can. 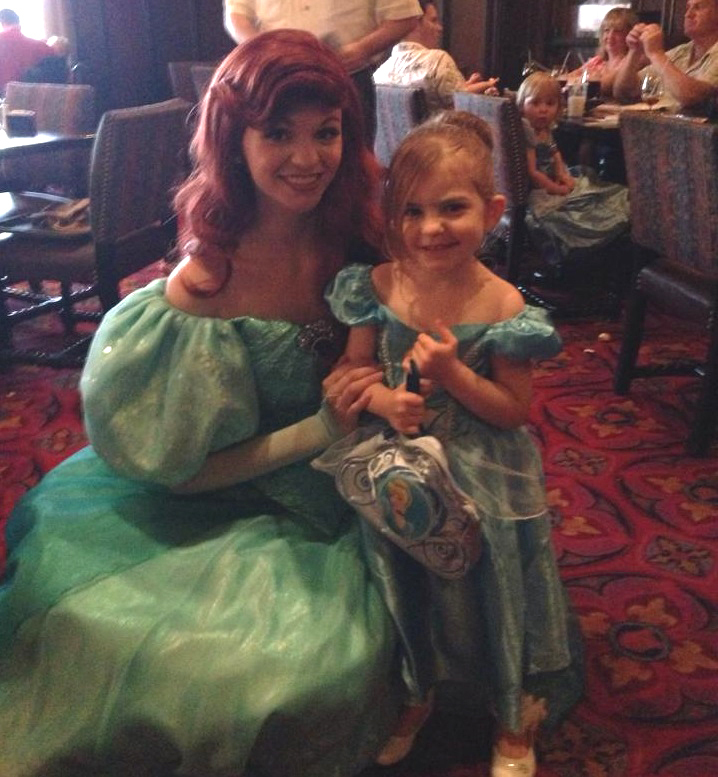 Meeting the princesses at Cinderella’s Royal Table! Join Pooh and his friends – usually Tigger, Eyeore and Piglet – at this enchanting buffet restaurant in Magic Kingdom Park! Expect a spread of cereals, baked goods, omelettes and fresh fruit for breakfast. For lunch/dinner there’ll be breads, salads, vegetable creations, meats and desserts. Children’s choices are also available. Insider Tip: Try to get an early breakfast reservation before the park opens, making sure it is not an Extra Magic Hours day. The price of the meal will be more than worth it for the photos of a deserted Main Street, U.S.A.! Characters include: Lilo & Stitch, plus friends! This fabulous restaurant holds a “Best Friends” Character Breakfast, with Lilo, Stitch and some favourite Disney Friends! Your food is served ‘family style’, which means it is brought to the table and shared out. The meal includes yummy breads (Freshly made Pineapple-Coconut Breakfast Bread – NOM), eggs, potatoes and meats and kids’ options. Insider Tip: Make sure you join in the ‘Ohana Family Parade! 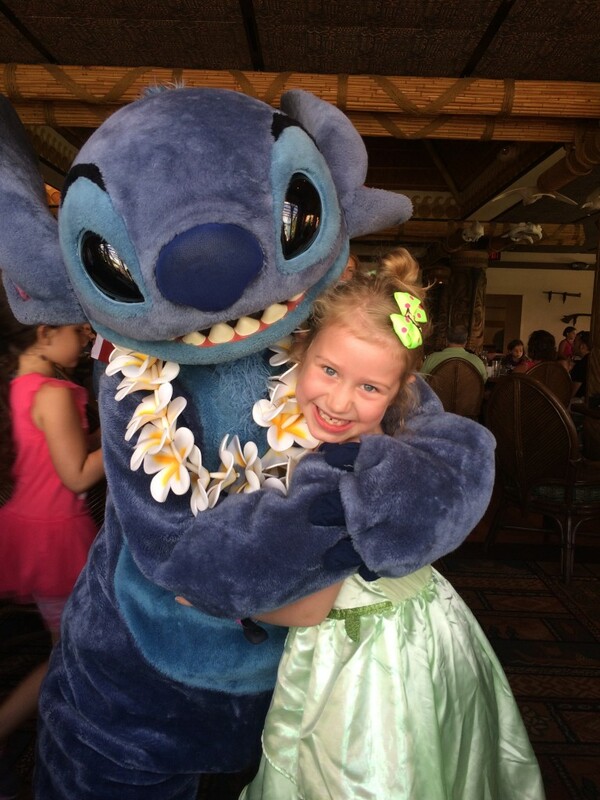 Cuddles with Stitch at ‘Ohana! If you fancy some delicious extras with your buffet then Tusker House Restaurant is definitely for you! Donald’s Safari includes a visit from Donald, Daisy, Mickey, Minnie and Goofy in their explorer outfits. For breakfast you can choose from a selection of pastries, hot and cold cooked items, Mickey waffles and fresh fruits. Lunch and dinner offer an African twist on salads, meats, fish, rice and vegetables. Insider Tip: Be sure to sample the Jungle Juice! Trattoria al Forno (Disney’s BoardWalk) – The Bon Voyage Adventure Breakfast, where you can meet Ariel & Eric and Rapunzel & Flynn. Breakfast is plated, with several tempting dishes on offer including breakfast calzone and frittata. I would strongly advise that you make your Advanced Dining Reservations for any Character Dining Experience you want to book to avoid disappointment. These meals are often included on the Disney Dining Plan, although Signature Dining can be 2 Table Service Credits per person. More about eating in Orlando! Please Note: The attendance of particular characters cannot be 100% guaranteed at any of the Character meals. Great article! It is so hard to choose a character meal and this really helps! Definitely agree the Tusker House character dining was worth doing. 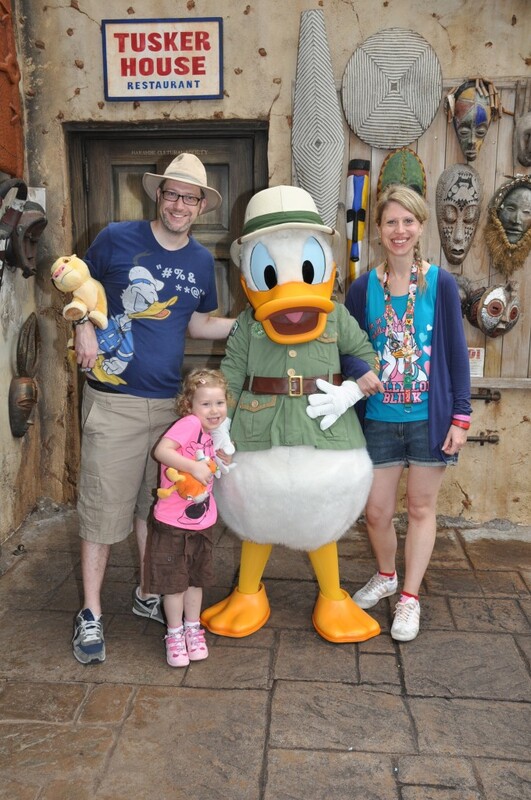 As well as a photo with Donald aswe went in Mickey and friends characters, in safari outfits, came round the restaurant meeting the diners and even got the children who wanted to join in to do a dancing train around the restaurant. The kids loved it.